Debt is one of the main reasons so many people live paycheck to paycheck. Unfortunately, there is no quick solution to debt. You can however be smart about your debt. Some things to consider when evaluating your debt include the amount of debt, interest rate, and debt sources. Looking at the combined debt of $35,000 here can be very overwhelming. Before attempting to tackle your debt, you need to create a plan. Let’s sort the debt based on interest rate. The larger the interest rate, the more money you are paying to keep that account open. Notice that the student loan has a significantly lower interest rate than the credit cards. This means that this debt does not cost as much to keep per dollar as the other debt. Additionally, student loans and home loans are considered Good Debt where car loans and credit cards are considered Bad Debt. Good debt is an investment or something that will grow over time. An education will cause your knowledge and income to grow and a house will appreciate over time. Bad debt is a debt that cannot be recovered. Over time, cars lose value. Similarly, items purchased on a credit card lose value over time. There are two main ways to tackle debt. One way is to pay off the one that has the highest interest rate first. This way, you minimize the fees you are required to pay. The second way is to pay off the debt with the lowest amount first. Neither way is better than the other, it is all up to preference. Once you decide which way you are going to pay off your debts, focus only on the debt you chose to pay off first. Of course, still make your regular payments on all of your debts. But, think in baby steps. The goal is to pay off one debt. Make sure to keep enough money in an emergency fund while paying off debts to ensure that you don’t incur more debt. Each month, use your new budgeting system and instead of having a category called ‘savings’, call that category ‘debt’. The money that is allocated for savings will go towards paying off the debt. The first debt is the hardest to pay off because it seems to go the slowest. Don’t give up. Once your first debt is paid off, give yourself a pat on the back. Great job! Now, pick the next debt to tackle. This debt will seem to go faster because you can not only apply the minimum payment that you’ve been making to the account, but you can also apply the money that you had been putting towards the first debt. Once you have your bad debt paid off, you can pay off your good debt monthly or apply some extra funds to your payment each month. Good debt is nothing to stress about and is normal. At this point, it is more important to have a substantial savings account than to have zero debt. Begin adding some money back towards savings every month. If your savings seems to be growing very quickly and you want to drop a large amount onto the loan, feel free! This is great news! You are living well within your means! Those printables are so cute and easy to figure out! I’ve never been great at debt management or budgeting so luckily my husband is! It’s all so confusing lol but you break it down in a way that’s easy to understand! My husband and I don’t have debt but I always find these posts so helpful/interesting on how to save more money too! Everybody can use a good reminder to be responsible and be a steward of money. Thats interesting topic!! 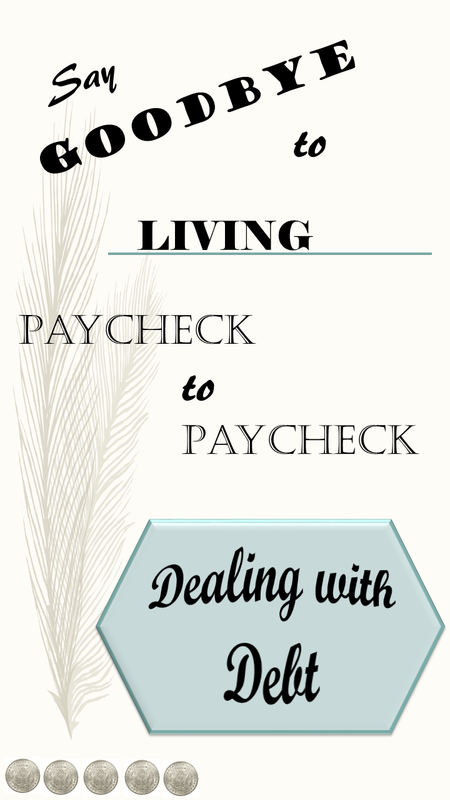 Im currently struggling with paycheck! Great tips! I have a whole excel spreadsheet dedicated to my finances. These are great tips! I started to be more on top of my finances this year and keep a spreadsheet with all of my interest rates and debt listed out, which helps it be less overwhelming for me to deal with. Have to keep track of my student loans and payments somehow!